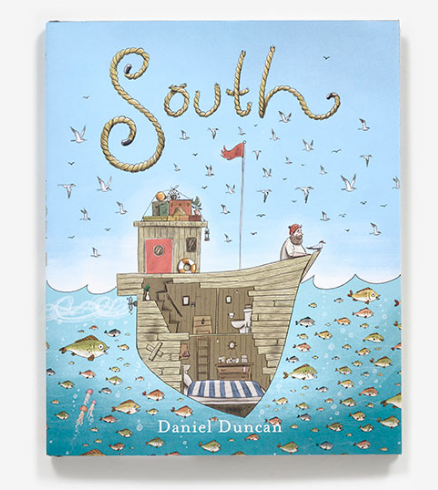 South is the debut picture book from British author and illustrator Daniel Duncan. 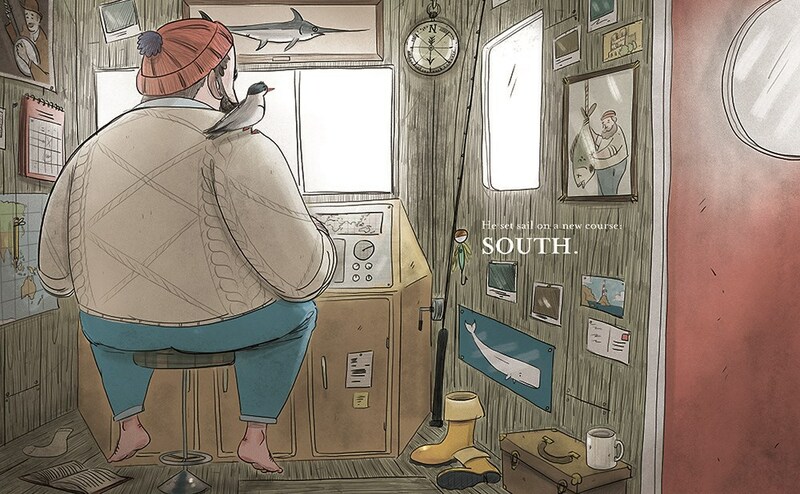 South is the story of a lone fisherman who finds an injured bird and helps it to heal. Knowing the bird can't survive in the icy ocean where he earns a living, the fisherman returns the bird to its proper, sunnier, habitat. 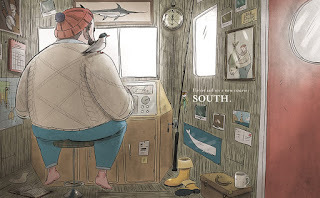 A seemingly simple story, yet, the visual and verbal storytelling Duncan employs in South makes for a deeply meaningful, moving picture book readers will linger over. While his words might be straightforward and spare, Duncan fills every page with detailed illustrations that give depth to the story. From the framed photos and memorabilia on the walls of the fisherman's cabin (including a snap of a happy family) to the belongings piled on top of his cabin, like luggage on top of a station wagon, loaded up for family vacation, you know there is a story within this story. 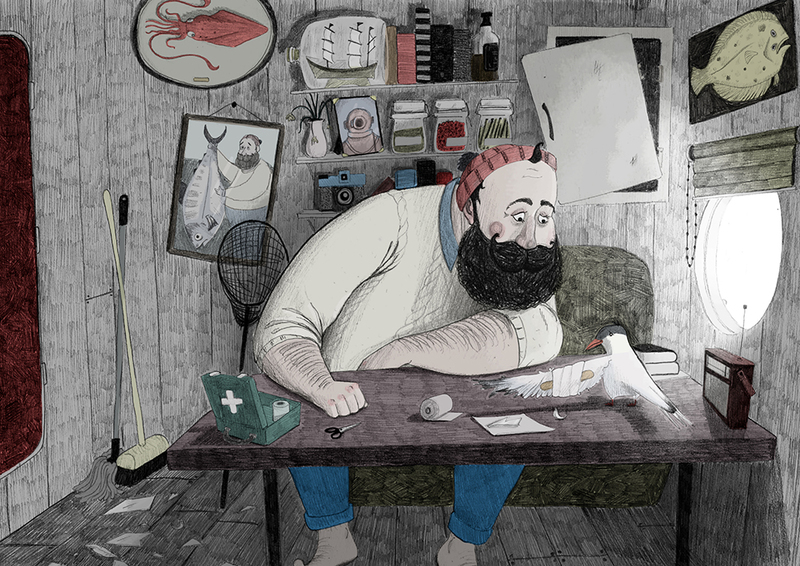 And, while the fisherman has a bushy beard and mustache covering half of his face, his eyes are full of emotion, making words unnecessary. 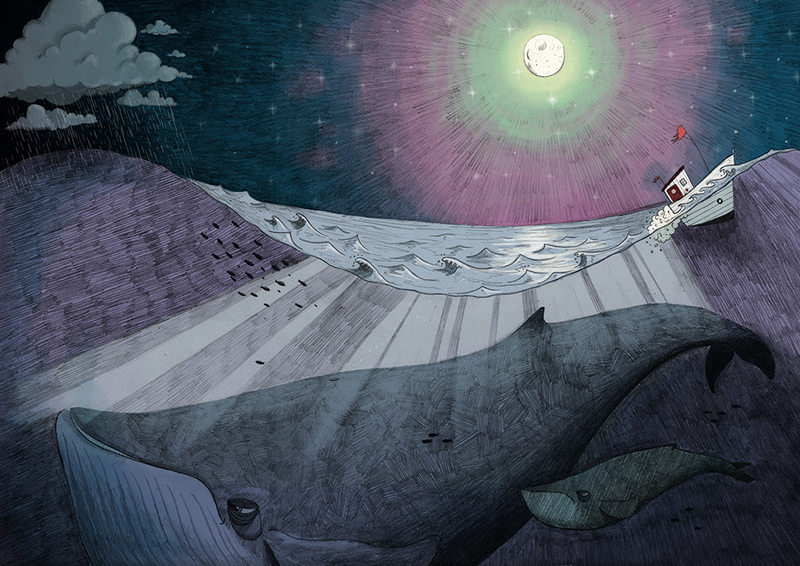 The ocean and its inhabitants also add depth to Duncan's story, calling up a range of emotions from loneliness to fear to connection. Nature and humans come together in this story that lets us know, this is how we work together, this is what's right, this is why we do it. I feel a little kooky ascribing all these larger, powerful meanings to Duncan's book, but there really is something going on in South, something that I definitely recommend you experience with the people and animals you come home to.